Saturday, December 6th is "Christmas-time in Berlin"
Free Beverages, Holiday Cookies, Vegan Diamonds, and Chowdah will also be available! Monday or Thursday Night Bluegrass Jam Band, BYO Instrument! Learn some Bluegrass/folk Songs and Jam with the rest of them! Learn to Play on your instrument with One Hour Group Music Sessions! Rock Jam Band, BYO Instrument! Learn some Rock Songs and Jam with the rest of them! Learn to Play on your instrument with One Hour Group Music Sessions! You will be grouped with the best group level for you. Practice is required every day. Watch you and your band progress as you earn band points every week! There is a $5 refer a friend discount to new Mock-Rock registrants! 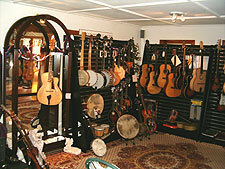 (One per family) Go to sales@mockingbirdmusic.com for instrument rental or purchase.